Research by Kantar Sport, the independent Sport Research and TV monitoring company, has revealed a global audience of almost 26 million for the 2014 TT Races, which represents a 5.7% increase on the 2013 figure. The 'Kantar Isle of Man TT 2014 Coverage Report' has confirmed that North One TV's twelve one hour international highlights programmes of the 2014 Isle of Man TT Races were broadcast in over 130 countries with a total of 402 hours coverage. In addition, North One TV produced 14 programmes for ITV4 that reached a total cumulative UK audience of almost 10 million viewers, up almost 8% year-on-year. New international broadcasters who carried TT coverage for the first time this year included Germany's Motorvision, L'Equipe 24/24 in France and Japan's G+Nippon alongside long term TV partners including Velocity in the USA, Fox Sports in Australia and African station Supersport. The TT's digital channels, managed by Duke Marketing, saw significant percentage increases across all platforms. The TT Official YouTube channel has recorded 10,441,230 minutes of TT footage watched, more than double the 2013 4,754,693 cumulative total. Popular footage includes Michael Dunlop's 2013 Supersport TT lap, which has been viewed by 1.9 million people in the 7 months since it has been uploaded, while a 2 minute edit of Bruce Anstey's 2014 outright lap record has already been seen by 890,000 people since June. North One TV's 22 minute edit of the Subaru timed lap has achieved over 1,000,000 hits since being uploaded four months ago. There are now over 47,000 subscribers to the channel, an increase of well over 37,000 on the 2013 figure. Although the number of iomtt.com unique users remained virtually static compared with 2013 at around 2.2 million, the number of people who accessed the TT live timing service rose from 239.068 to 267,176, an 11% year-on-year increase. 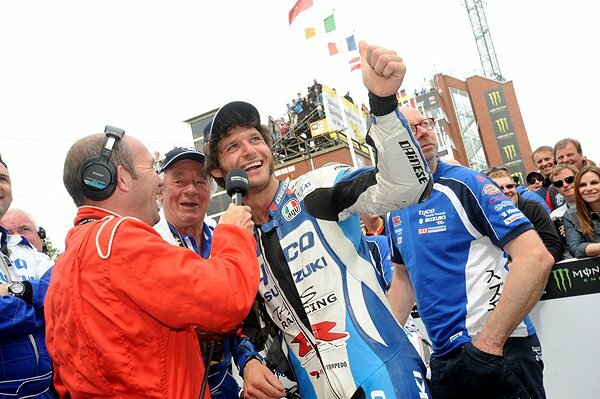 Manx Radio's live commentary audience through traditional on Island radio platforms as well as on-line via the iomtt.com website and TT App reached a total number of 491,666 unique users over the TT fortnight who made 3.978 million successful connections to the service. Senior Race Day itself saw 48,923 unique users make over 600,000 connections to the race commentary. The Official TT Facebook page now has 347,000 likes which represents a 120% increase in a year while over 60,000 people now follow the Official TT Twitter feed. This year's Official TT programme, produced by Mannin Media, saw an 8.5% increase in sales, following on from last year's 7.5% increase. An analysis by Dublin based Olytico through on-line research has shown global media coverage growth of 11%. The USA is now the leading market for TT media coverage by volume followed by the UK. The traditional European markets of Germany, Scandinavia, France, Italy and Spain are all showing year-on-year increases while Australia's coverage has also risen compared with 2013 results. "The rise in media profile is vital for the long term success and development of the event as we are able to capitalize this through increased revenue from our sponsors and other commercial channels." "We can also link the rise in visitors to the event's growing media profile, particularly with regard to the television product where we can directly attribute international enquiries to country specific TV distribution." Guy Martrin greets the fans after the Senior race, while talking to Chris Kinley of Manx Radio.